We met with Sarah & David over the Internet for their Civil Marriage In Turkey-Antalya. Sarah and David chose our wedding partner in Kundu WoW Topkapı Palace Hotel for accommodation and they decided to come to Turkey with their big family. 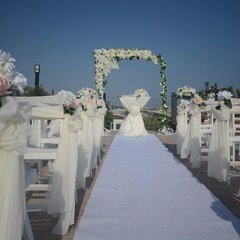 Also, they decided to have their wedding in Turkey at our another wedding partner Limak Lara De Luxe Hotel. She made me think wider by taking a bright view of my offers I have provided and supporting all of my creative thinking. We wanted them to experience the different excitement at WoW Topkapı Palace Hotel. 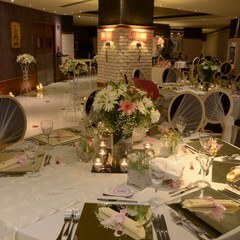 We have prepared a small wedding story as we know that a differently themed wedding will make happy all of them. We have organized a bridal convoy according to Turkish culture by preparing a classic Chevrolet car and taking from Ottoman themed WoW Topkapı Hotel. David went to Limak Lara De Luxe Hotel with all guest by 12 taxis as the bridal convoy. 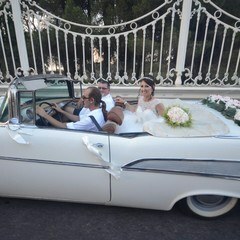 We have brought Sara & her father to Limak Lara De Luxe Hotel by special decorated classic Chevrolet bridal car by taking the photo of every meter. The bridal car was a nice surprise for Sarah & her guests. 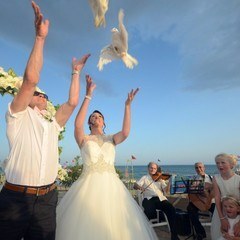 Civil Marriage Ceremony of Sarah & David started at 17:30 o’clock at Limak Lara Hotel followed by the wearing ring ceremony, champagne ceremony and releasing the doves as a symbol of happiness. We got the biggest surprise together after every step finished. The sun has disappeared, It started to rain. We thought that It’s a just summer rain which takes time only 2-3 minutes but nature did the biggest surprise to us. We got wet in the rain very badly. Children had the most fun at the wedding dinner. 14 children of all ages. The wedding venue was chirping and mirthful. 15 June 2015 was very special for all of us. Sarah & David was an amazing couple. They were absolutely stunning. It’s not possible to forget them. They have had fun with their family and friends during the photoshoot ceremony. We as a team joined their happiness and fun with a great pleasure. It was a perfect wedding, we will always miss you.